2014 brought with it an array of celebrity weddings. From Angelina Jolie and Brad Pitt’s private wedding in France to Kim Kardashian and Kanye West’s high profile nuptials. There’s no doubt that each individual desires to make their ‘special day’ one to remember. While we often try to mirror the lavish weddings of our celebrity idols, weddings can lead to a mountain of debt. Often taking longer to settle than to acquire. Planning a wedding is a big commitment for those who have decided to take that next step. Wedding costs can easily spiral out of control – attire, rings, entertainment, invitations, a venue and honeymoon costs all adds up. Before you start planning your big day, sit down with your partner and discuss what both of you can afford. 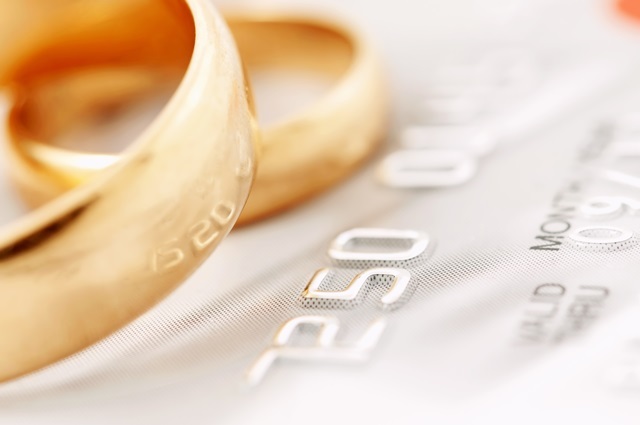 Determine how much each partner can contribute toward the wedding. Traditionally the parents also contribute to the wedding fund. Speak to everyone who might contribute to the wedding fund to determine how much you will be able to spend on the wedding. Be open and honest as this will allow you to establish the financial end goal. The financial end goal will differ from couple to couple. Whether you require x amount of cash for a venue in Cape Town, or a few thousand for a horse and carriage to chauffeur you, acquiring quotes will make you aware of how far both of you still need to go until your goal is reached. Draw up a budget with a complete list of wedding items. Insert two columns. One column for cost estimation, and the second column for the actual cost. The first column will serve as the initial projections of the wedding costs. Once you receive quotes you can compare it with your initial projections. This will determine if you can afford that specific item. Some items will be less than you initially projected, while others will be more. The trick is finding the balance and deciding which items you can compromise on. Visualise the whole event step-by-step, write down what will happen from the moment you wake up on your wedding day, up until the time you leave the wedding. Visualising the detail will enable you to see how things are going to be on your big day. This will help you decide where you can opt for cheaper alternatives. Plus, it will also help organise everyone assisting you on the day. Limiting mistakes and bloopers could save you money. Contact multiple providers and compare their prices. When having your wedding in a metropolitan area you should consider getting quotes of providers outside the city’s boundaries. Close-by towns or areas offer many, well established, professionals without the big city price tags. Just double check their portfolio and references to make sure you get the best service or product. If you want to save money avoid bridal boutiques, especially when it comes to wedding invitations and décor. Rather find out who the supplier of the boutique is and go to them directly. Wedding invites, table placings and menus are easy to make at home. If you have ribbons that need to be tied around serviettes or something that you can easily do at home, do not outsource it. Find the time, get creative and do it yourself. It can be fun to do things together before the wedding. You will be surprised how many of your friends and family wouldn’t mind giving a helping hand. Think twice before buying a wedding gown or tuxedo that will only be worn once. Where possible rent rather than buy items such as attire, jewellery and accessories. The cost of purchasing a wedding dress can sometimes be four times more expensive than renting the same type of dress. Many dress boutiques or makers offer free adjustments and fittings to ensure that even your rented dress looks like it was tailor-made for you. In a situation where the groom really wishes to buy a suit, try to get a suit that can be worn as a business suit after the wedding. Getting things to serve a dual purpose can save you money. Once engaged, take your time to plan your wedding day. Give yourself enough time to find the best possible pricing options. Throughout the year providers will have special offers. Make sure you have enough time during the planning period to catch a good deal here or there. Remember, this is your day; you can choose the ‘what’ and the ‘how’. Considering that traditional wedding items tend to be extremely expensive, it will give your budget a break if you decide to ditch the items you don’t really want. For example, if your venue offers a mouth-watering desert that is already included in the price, then you can opt not to have that expensive wedding cake. Many people don’t include the honeymoon in their wedding budget. Your honeymoon can cost a huge amount of money, and thus I would advise people to include this in the budget and consider the cost of the honeymoon. A great plan is to start searching for honeymoon accommodation early on. Don’t wait until the last moment. Rather shop around for affordable packages. Remember, you don’t need to travel abroad, local is lekker! We live in a beautiful country, and a honeymoon is the perfect time to explore it. Plus it will cost you less than the alternative. Deciding to wed on a popular date, which includes public holidays, Valentine’s Day as well as most weekend dates in the summer months can add significantly to the costs of your wedding. Suppliers are well aware when the wedding season arrives and often mark up prices as a result. Being selective of when you say ‘I do’ can often influence the amount you pay overall. It can be tough having your heart set on a specific location, supplier or designer when it comes to your wedding. However, if you cannot afford it, slightly cheaper alternatives should always be considered where need be. The resources you require are often more accessible than you think. Don’t hesitate to approach family and friends to assist in the planning and execution of your wedding day. Rather than hiring a courier service to deliver invitations, ask for assistance from family members. In the same way, rather than hiring vehicles, ask family members or friends to drive. Planning a wedding is one of the biggest expenses one can undertake. Incurring debt as a result can serve as an unpleasant reminder if not approached correctly. Taking these tips into consideration can set you on the right path to having the wedding of your dreams while still being financially free. How Is Your Financial Mentality?